We inform you that we are looking for 3 motivated volunteers for IES Campanillas. We are looking for candidates from EU and neighboring countries. This project is carried out CES Santa Maria de los Angeles, the centre for secondary education in the city of Malaga. This city is situated in the Southern Spain in the autonomous community of Andalusia. It is a cosmopolite coastal city of a warm climate and has an important cultural diversity. Our Association is founded for the youth who come from different social classes, cultures and geographical locations. Our area of influence extends to the Carranque region, an area with a middle low socio-economic level, and where our Association has an important influence, both by its openness and by the activities it promotes. to update social networks such as school blog, web-site, facebook, etc. to organize some workshops for students to develop international partnerships: Erasmus, Leonardo, Youth in action, etc. Gaining experience in useful skills for their professional future. The volunteer program provides skills and experiences, increases job possibilities and gives the chance of doing different jobs, so a choice is possible. Learn new skills. The volunteer program enables new challenges, know new people, new perspectives and ways of living which may encourage volunteers to reconsider their world perspectives. Motivation and interest for this type of volunteering project. Ability to adapt to different cultural and social environments. Commitment and responsibility to the objectives of the project. Be able to work and animate a group. For this process, we will develop a form of skills and attitudes that will guide us throughout the process, and help us as a tool for the selection of candidates. We also plan to conduct Skype interviews with the volunteers in order to get to know them better, and equally for them to know us. We do not have any kind of preference regarding the sending entity. The school has approximately 350 students. Collaborate in the educational work of the Centre, collect and express opinions and suggestions of the students, encourage participation and promote associative and team-work values. To promote and organize cultural, artistic and recreational activities. To carry out voluntary activities both at the provincial, European and international levels. Carry out Youth in Action programmes, both European and international. Training courses and socio-cultural activities. Voluntary activities related to the environment, participation, promotion of the culture of peace, social and community interest, and by that promotion of multiculturalism. Activities aimed at cultural exchange. It comprises young volunteers who share an interest in social and cultural activities, environment, promotion of the culture of peace and multiculturalism, and shares all this in the educational Centre. Recipients are not only the youth of the center, but because of the openness and participation in various European youth activities, we can speak of a local, regional and European impact. Volunteers could cook their meals by their own in their flats, they are going to receive 150 euros each month. Each volunteer will be given a monthly allowance of 150 euro for personal needs every day. Every volunteer will have a chance to choose BIKE or BUS CARD if he/she lives more than 2,5km from the school, long distance activities will be covered by hosting organization if it is needed. Every volunteer is entitled to receive language support with an online platform, as stated in Erasmus+ programme. 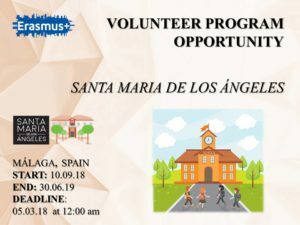 The volunteer will have the same holiday days as the rest of the School Team (Christmas holidays, easter holidays, White week in February and the rest of holidays of Andalusia and those the municipality authorities have planned in the school calendar). The mentor will offer constantly his support and personal assistance to the volunteers. The applicant organization/sending organization/hosting organization is responsible for the volunteer’s insurance, all the parties are obliged to get acquainted with the insurance rules. Anyone interested may read the info below, fill in the online application form and attach their CV and motivation letter (in english or spanish) before the 5th of March. Selected candidates will be interviewed on skype one day from 19th and 22th March.